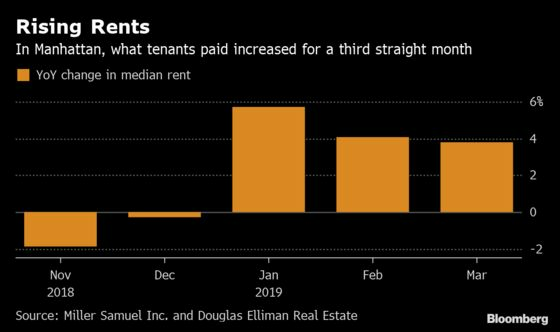 (Bloomberg) -- New York City apartment-dwellers were on the move in March, signing a wave of new leases as landlords raised rents. In Manhattan, signings climbed 21 percent from a year earlier, appraiser Miller Samuel Inc. and brokerage Douglas Elliman Real Estate said in a report Thursday. The jumps were more pronounced in Brooklyn and northwest Queens, at 40 percent and 26 percent, respectively. The data don’t include renewals. Tenants lost patience with landlords who have gotten more aggressive in raising rents when leases expire, said Hal Gavzie, Douglas Elliman’s executive manager of leasing. So instead of renewing, many New Yorkers moved to take advantage of perks that often come with new agreements, such as a free month or two, he said. New leases totaled 4,234, up from 3,489 a year earlier. It was the first annual gain after four consecutive months of declines. Rents have climbed every month this year. The median minus the value of concessions was $3,288, up 3.8 percent. The vacancy rate fell year over year for an 11th straight month as pickings got slimmer. Inventory dropped 10 percent, to 5,171 units. The jump in new leases, to 1,327, was the biggest in 15 months. 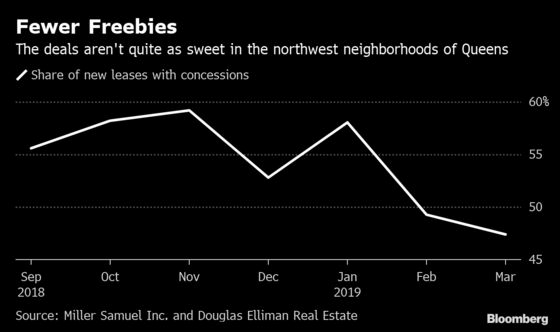 Landlords offered sweeteners -- averaging 1.6 months of free rent -- at three-quarters of new-development units, while just a third of existing rentals had a concession. The median rent rose from a year earlier for a fourth straight month, up 5.8 percent to $2,781. 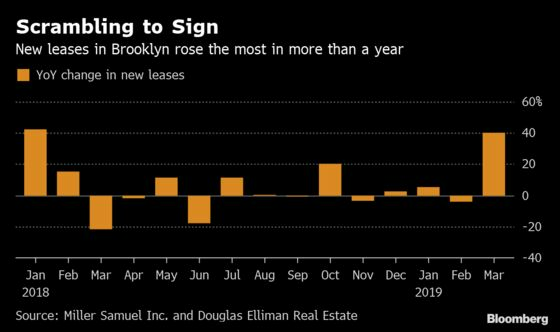 The share of new leases with concessions fell annually for the first time in seven months in the borough’s northwest area, including Long Island City, Astoria, Sunnyside and Woodside. Rents climbed for the fourth time in the past five months, up 4.8 percent to $2,682.